One of the things I see empaths struggle with the most is managing their chakras, which help you manage energy and emotions in your body. Especially that solar plexus chakra, the personal power center AND the one that lets you take action on your dreams. Fortunately, adjusting your chakras for better emotional and energetic health is one of the quickest fixes. This video provides a quick overview in case you’re not familiar with the chakras or if you want to brush up on what they are and how they work. The root chakra helps you build a solid emotional and physical foundation in your life. The sacral chakra relates to passion, creativity, and relationships, among other things. Find out about how you can grow it stronger. The solar plexus chakra helps govern confidence and empowerment in your life. If you need help taking action toward your dreams, make sure you don’t miss this one. Check in on your heart chakra. It relates to your feelings of compassion and connectedness with the world as a whole and the people around you. The throat chakra relates to communicating effectively. If you feel like you’re having trouble communicating your personal truth to others, be sure to watch this video. The brow chakra has to do with psychic phenomena and your connection to messages from the universe. If you’re interested in tuning in more to your intuition and guidance, check out this video. Finally, the crown chakra is connected to your sense of spirituality and your connection to source. Click below to watch and learn more! Spiritual Mechanic has a new round of the Empath Mechanics course opening up soon. 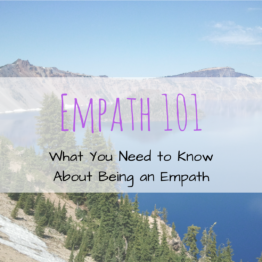 If you’re interested in learning more about how to be an empath, keep your eyes open for it. Sign up for the email list below to make sure you find out about it!